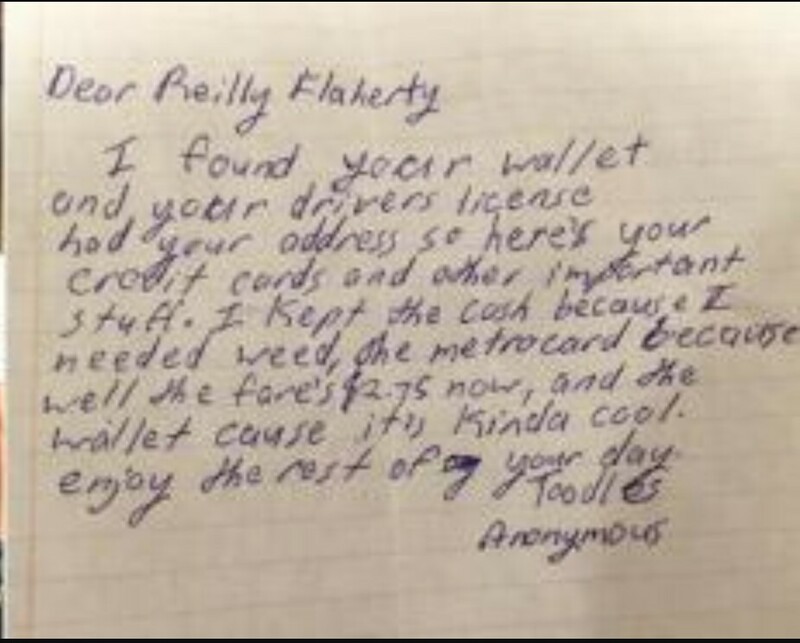 Skooch – One Lower East Side man received what some have called “the most New York note imaginable” after losing his wallet at a concert. It’s tough to be mad at this good Samaritan. He or she went out of their way to return some of the items to this guy, and kept the things that would be useful to them. If you can’t sympathize with a guy or a girl who need some extra cash to buy weed, doesn’t feel like paying for the Metro and enjoys nice wallets, then I don’t know what to say to you. Credit cards are the birds, and what’re you going to do with another person’s license anyway? I couldn’t love this style more if I did it myself, and now I have a blueprint for the next time I find a missing wallet at a concert. Posted on February 17, 2016, in Average Blog Posts and tagged missing wallet, New York, note, reilly flaherty, wilco concert. Bookmark the permalink. 1 Comment. Can’t symaphiaze with a thief.